Spend over $50 or more at Honey Bean Coffee and take $5 off your total with this coupon code. Get free shipping with HoneyBeanCoffee.com when you spend $75 or more. Just use this code. Get a $4 discount off any order of $41 or more, plus flat rate shipping still applies. Use code to save. 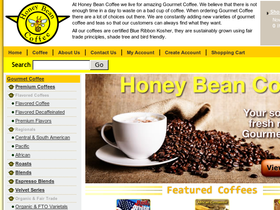 Save 5% off your order from honeybeancoffee.com. Use this code to save.